This is warm, cheap and so so good. You can buy beef mini meatballs from the supermarket, which makes this extremely easy to put together, Woolworths supermarket sell Ingham chicken or beef meatballs and you can buy two packs for $10 - the chicken ones work great in this recipe. I prefer to make my own meatballs, then I know what's in them! (500g minced beef, one large egg and half a cup quick cook oats - mix well and roll into small balls) but so long as you're happy with the provenance of the meat go with bought ones. Likewise you can buy a $4 packet of diced pumpkin at the supermarket too...or cut it up yourself. once everything's swimming in its mellow sauce, no one is going to be asking questions. Putt the pumpkin on a tray and drizzle with olive oil - bake for 40 mins. Heat the red curry paste and vegetable oil in a large wide pan; when it starts sizzling, add the meatballs, turning them in the red oily mixture till they are browned. Sprinkle the cinnamon and ginger over the meatballs and fry for a couple of minutes. Add the coconut milk, chopped tomatoes , then the stock and honey. Take your pumpkin from the oven. Stir in the baked pumpkin. 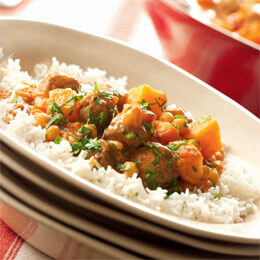 Serve with rice and decorate each plate with some chopped coriander.